What do we value? What is at risk? What outcomes do we wish to avoid with respect to these valued things? What do we expect to happen in the absence of adaptive action and/or mitigation? How bad could things plausibly get? Are there important thresholds or tipping points in the unique context of a given region, sector, and so on? 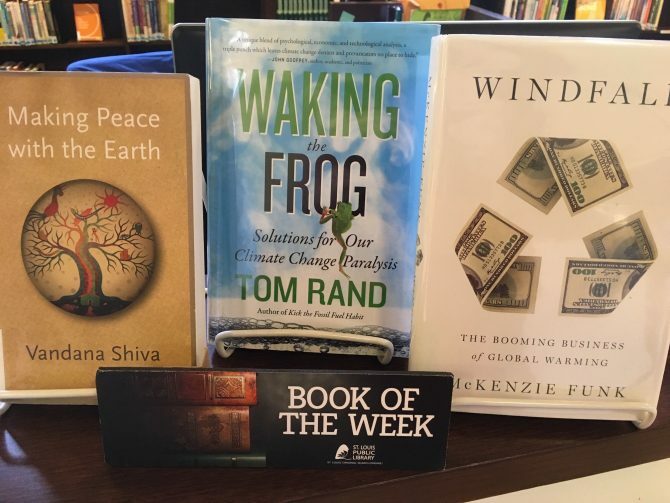 St. Louis Public Library has considerable resources to assist in digging into the topic of climate change, including previous government reports, books aimed at predicting (and hopefully heading off) the worst consequences, authors who challenge the concept of climate change, and practical suggestions for those seeking to make a difference on either an individual or global scale. We have pulled many of those resources into a book display in the Social Sciences room (though some of the books were borrowed from the Science and Technology room in the 551.6 call number vicinity - like Weather - as well as one title from Fine Arts, Our Beautiful, Fragile World); come to Central Library and peruse the books in person (& maybe check a few out), or click here for a list to explore virtually (& from which you can place books on hold and summon them to a branch near you). As a Federal Depository Library, SLPL receives copies of many government publications, including Climate Change Impacts on the United States, the first report issued pursuant to the Global Change Research Act in 2000, & supplementary materials such as "Perspectives on Climate Change," a March 2007 hearing before the Subcommittee of Energy and Air Quality of the Committee on Energy and Commerce and the Subcommittee on Energy and the Environment of the Committee on Science and Technology of the House of Representatives, or "Our Changing Planet - The U.S Climate Change Science Program for Fiscal Years 2004 and 2005 available on CD-ROM. As a public library, we are committed to representing all sides of an issue and providing our patrons with the information that they need to make up their own minds. 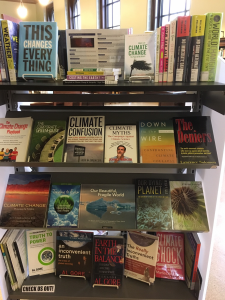 To that end, alongside the climate change firm believers are some skeptics and deniers, as illustrated by the "Inconvenient Truth" shelf of the climate change display. Here patrons will find Al Gore's works on the subject, including Earth in the Balance, An Inconvenient Truth (also available in 2006 or 2017 DVD versions), and An Inconvenient Sequel (also a CD or downloadable audiobook and Blu-ray or DVD), along with The Really Inconvenient Truths - Seven Environmental Catastrophes Liberals Don't Want You to Know About—Because They Helped Cause Them (also a streaming audiobook). Patrons curious or concerned about their carbon footprint and lifestyle changes they might make to lessen it may want to check out titles like How Bad Are Bananas - the Carbon Footprint of Everything, Plastic Purge - How to Use Less Plastic, Eat Better, Keep Toxins Out of your Body, and Help Save the Sea Turtles!, or Gorgeously Green - 8 Simple Steps to An Earth-friendly Life. Some good news on this front: our public library patrons are reducing, reusing, and recycling each time they check out a book.